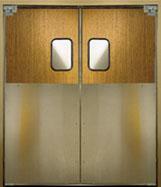 We are your online source for retail traffic doors. 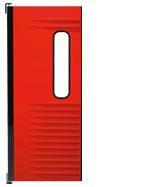 Click on the door images to see the door attributes and specifications. Double acting door designed to compliment today's more vibrant store decor. Rigid aluminum Back spine in powder coated black or gray. Designed for the toughest industrial, warehouse, food processing, and industrial applications. Internal steel reinforcement added for extra strength and durability. 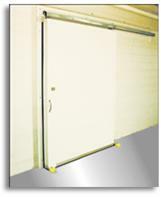 Flexible doors that provide a cost effective traffic door for high traffic applications. Designed for pedestrian and non-motorized applications. Operates on the exclusive Chase gravity-open hinging system with hardened steel cams and rollers from a long service life. Available in single, double, or cafe styles. 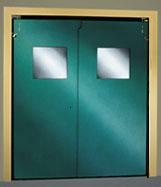 These fire door systems are used in commercial and industrial applications where a fire barrier is required. Each door is custom manufactured to your specifications. 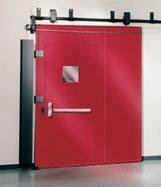 Strip Doors Provide a physical barrier to help isolate your employees from unwanted noise or pollution. ThermaGard doors combine the latest in technology with quality materials and workmanship. Panel finish is available in galvanized, aluminum, stainless steel, or fiberglass (Anti-corrosion packages are available. Turn the surface of your traffic door into an attractive brand awareness space. If your store looks good, you look good! The Durulite QuickSlide is a low cost alternative that is quick and easy to install. Bi-parting panels provide usable space faster than a High Speed Roll-Up Door. 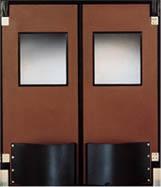 The lightweight door panel is constructed from roto-molded cross-linked polyethylene with a high density Non-CFC foamed-in-place core and is internally reinforced with a 1 x 1 tubular steel. The low maintenance panel is impervious to acids, petroleum products, animal fats and cleaning solvents and will retain an attractive appearance even in the worst atmospheric conditions. 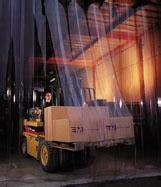 Cut heating and cooling costs by controlling airflow around the docking doors.